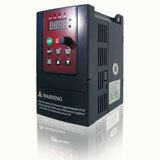 What is minimum frequency that VFD can run? HomeFAQWhat is minimum frequency that VFD can run? A VFD (or VSD) can operate down to its minimum designed frequency, however the motor design and load characteristics determine the minimum PRACTICAL frequency. If the motor is force cooled and the variable frequency drive is operated in vector mode, as long as there is encoder feedback, and the load is not excessive, it is possible to achieve 100% torque at zero frequency. 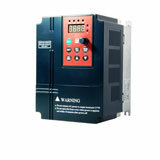 Some manufacturers' variable frequency drives can provide 100% torque at Zero speed without an encoder. A properly rated and designed motor can be provided to operate at Zero speed, full torque (often called 1000:1 speed range motors). This is a very typical motor requirement for Paper Winders and Rewinders, and Steel Coilers and Uncoilers. The so-called Variable Frequency Drive (VFD) parallel connection technology indicates that two or more sets of small power VFDs are connected in parallel to drive a high power motor. However, since it is inverting frequency output, several problems as follows need be solved firstly.